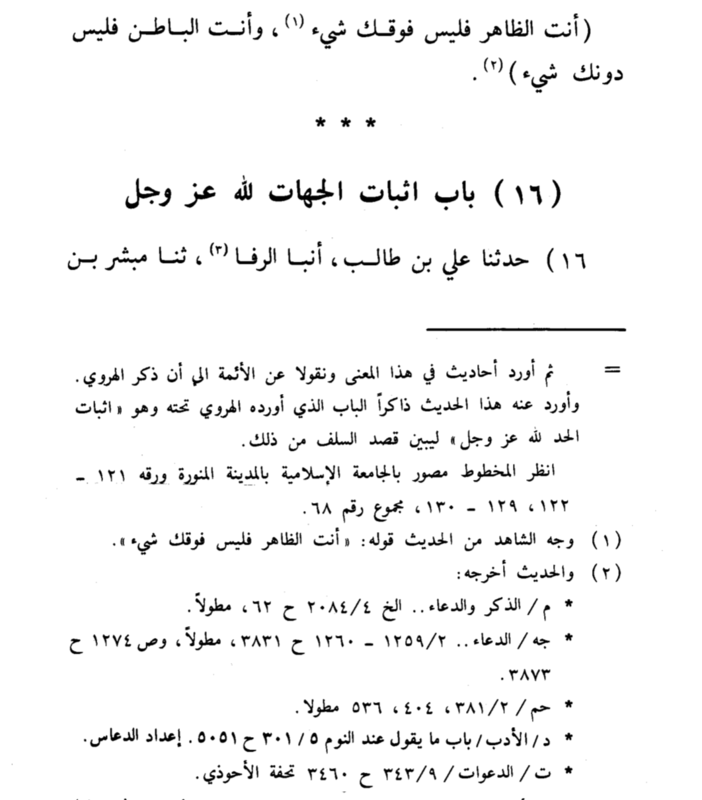 Reported by Muslim (62), Ibn Mājah (3831, 3873), Ahmad (2/382, 404, 536), Abu Dawūd (5051), and At-Tirmidhee (3460). “Allah, the Most High, said: ((He it is Who created the heavens and the earth in six days and then ascended over the Throne. He knows what goes into the earth and what comes forth from it, what descends from the heaven and what ascends thereto. And He is with you wheresoever you may be.)) So Allah, the Most Perfect, has stated that alongside His Highness over His Throne, He knows everything – so His Highness does not prevent Him from having knowledge of all the affairs…” See Majmoo` al-Fatawa 5/498-499. Al-Bukhāree said that Yahyā Ibn Ziyād al-Farrā’ said: “He is Adh-Dhāhir, over everything all-knowing. He is Al-Bātin, over everything all-knowing.” Al-Hāfidh Al-Mizzee said: Yahyā Ibn Ziyād al-Farrā’ had a book entitled: “Ma`ānee al-Qur’ān (the meanings of the Qur’ān)”. So Al-Bātin refers to Allāh knowing what is hidden and secret and the minutest of details, and there is none closer to a person than Him in terms of knowledge of those matters to the extent that nothing is hidden from Him. 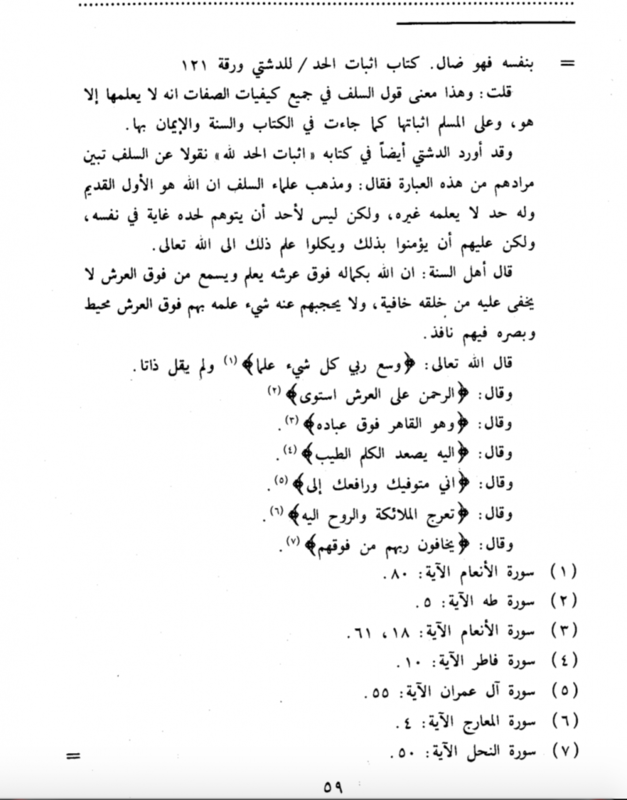 See: As-Sawā`iq al-Mursalah and Tareeq al-Hijratain of Ibnul-Qayyim (rahimahullāh); and Shaikh Sālih Ālush-Shaikh in his explanation of Ibn Taymiyyah’s, Al-Hamawiyyah. 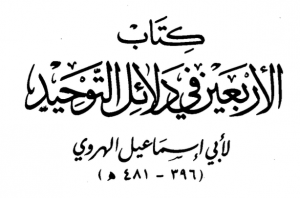 Imām Ismā`eel Ibn Muhammad Ibn Al-Fadl Al-Asbahānee (rahimahullāh) said: “The people of verification and insight have discussed the explanation of ‘Al-Hadd’ (الحد) with various expressions. And what is attained from these expressions is: that Al-Hadd is every thing whose place is separate and distinct from another. So if the intent of the one who says that “there is no limit for Allah”, is that the knowledge of the created beings cannot encompass Him, then he would be correct. And if his intent by this is that Allah’s knowledge cannot encompass Himself, then such a person is astray.” (Kitāb Ithbāt Al-Hadd of Ad-Dashtee, p. 121) I (Shaikh Ali Nāsir) say: This is the meaning of the saying of the Salaf concerning every matter of “how the Attributes of Allah are” – and that is none knows the “how” except Allah. And upon the Muslim is to affirm the Attributes as they are mentioned in the Book and Sunnah and to have imān in them. Thereafter he brings hadeeth narrations with this same meaning, and citations from the Imāms until he mentions this narration of Al-Harawee. 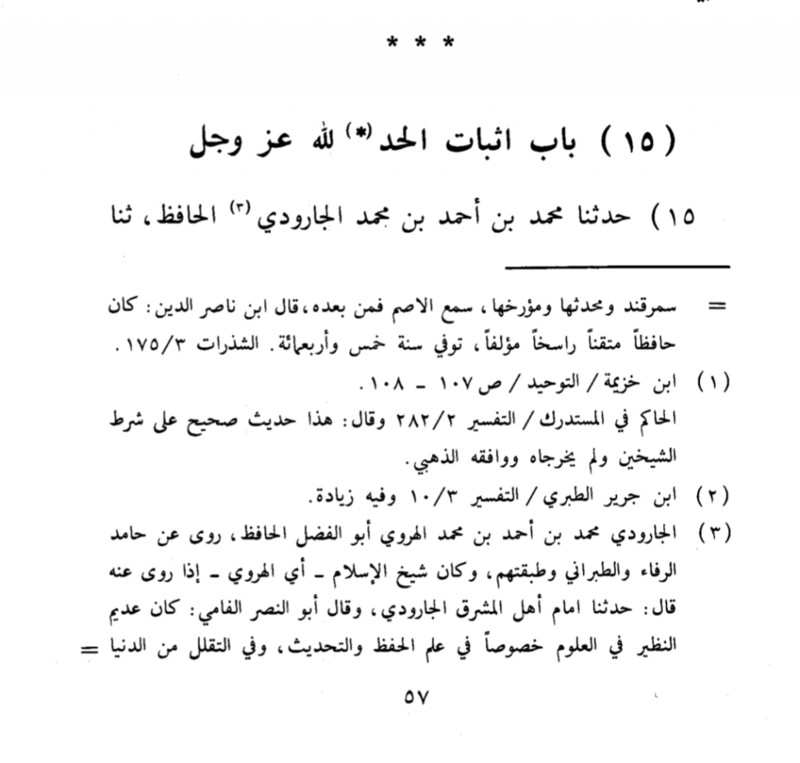 He brings this narration from him mentioning the chapter that Al-Harawee himself brings and that is: “Affirming Al-Hadd for Allah, the Mighty and Majestic” for the purpose of clarifying the intent of the Salaf regarding that. 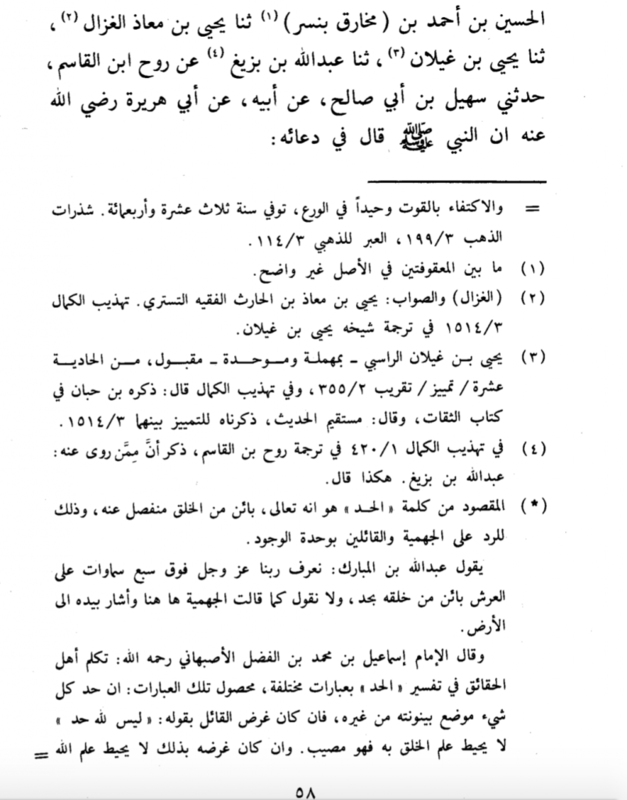 See the preserved photocopies at the Islamic University of Madinah Munawwarah: pages 121-122, 129-130: compilation no. 68.